Die cut components for wicking fluids are used in medical, bioscience, and filtration applications. They are made of porous plastic materials with open-celled structures and omni-directional pores. Depending on your application, a specific POREX wicking material may be required. POREX, a trademark of POREX Corporation, is a family of porous thermoplastics that support precision die cutting. POREX wicking material is designed to optimize fluid transfer (wicking) for a specific end-use requirement. The wick’s open-celled structure supports the control of liquid volume capacity and fluid transfer rates. The wick’s surface energy can enhance media capillarity, the rise or depression of a liquid in a small passage such as open-celled, omni-directional pores. 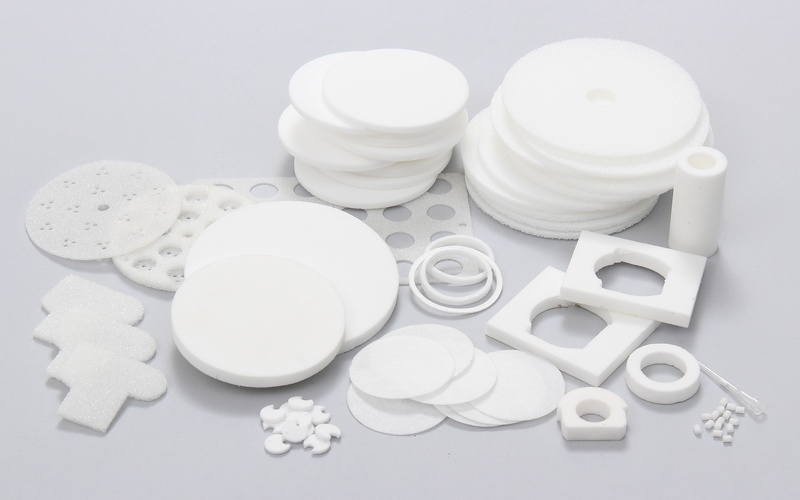 Die cut components for wicking fluids are made from different types of porous plastic products. Polyethylene (PE) resists concentrated acids, alkalis, and many organic solvents. PE wicks are strong, tough, and lightweight. Polypropylene (PP) resists most acids and alkalis. PP wicks can be subjected to steam sterilization, and combine resilience with resistance to fatigue. Polytetrafluoroethylene (PTFE) is chemically inert and thermally resistant. PTFE wicks can be subjected to steam and ethylene oxide (EtO) sterilization. Other porous plastics for die cut wicking components are available. Examples polyethersulfone (PES), and PP/PE co-polymers. POREX wicking material made from ultra-high molecular weight polyethylene (UHMWPE) also can be die cut from sheets and rolls. Die cut components for wicking fluids are used in clinical science applications such as in vitro diagnostics (IVD) and ovulation and pregnancy testing. To ensure quality and cleanliness, lateral flow assay wicks and urine and saliva collection media wicks may require the services of an ISO 13485:2016 certified die cutter. Die cut Porex wicking material is also used in adhesive applicators for medical devices. Interstate Specialty Products (ISP) sources wicking materials from the POREX and can die cut porous plastic components with speed and precision. ISP is an ISO 13485:2016 certified die cutter with a Class 100,000 (ISO 8) cleanroom. To learn more about our medical die cutting and cleanroom capabilities, please contact us.